„Easy Lover“ — ფილიპ ბეილის და ფილ კოლინზის სიმღერა, დაწერილი ბეილის, კოლინზის და ნეითან ისტის მიერ. იგი შეტანილია ბეილის სოლოალბომში Chinese Wall. კოლინზი სიმღერას ასრულებდა საკუთარ კონცერტებზე. იგი შეტანილია მის 1990 წლის საკონცერტო ალბომში Serious Hits... Live! და 1998 წლის კომპილაციაში ...Hits. სიმღერა რამდენიმე ქვეყანაში ჩარტის პირველ ადგილს იკავებდა - მათ შორის, კანადაში, ნიდერლანდებში, ირლანდიასა და გაერთიანებულ სამეფოში. აშშ-ში იგი Billboard Hot 100-ის მეორე ადგილზე 1985 წლის 2 თებერვალს მოხვდა და ორი კვირის განმავლობაში იკავებდა (რის გამოც ჯგუფ Foreigner-ის "I Want to Know What Love Is"-მა სიაში უკან დაიხია). ბრიტანეთის ჩარტში იგი ოთხი კვირის განმავლობაში #1 იყო. ამავე ტერიტორიაზე მან მოგვიანებით ოქროს სერტიფიცირება მიიღო. აშშ-ში გაიყიდა მისი მილიონი ასლი. სინგლი აგრეთვე სერტიფიცირებული იყო ოქროს სტატუსით (RIAA-ს მიერ). გარდა ამისა, ბრიტანეთში მას 400.000-ზე მეტი გაყიდული ასლისთვის ოქრო ერგო, ხოლო კანადაში - პლატინა. "Easy Lover"-ის ვიდეომ მიიღო ჯილდო MTV-ის მუსიკალური ვიდეოების დაჯილდოებაზე (საუკეთესო ზოგადი შესრულება ვიდეოში), 1985 წელს და იყო ნომინირებული გრემიზე 1986 წელს (საუკეთესო პოპ-შესრულება დუეტის ან ჯგუფის მიერ ვოკალებით). ოფიციალური ვიდეო გადაღებულია ლონდონი და წარმოადგენს ვიდეოს, რომელშიც აღწერილია სხვა ვიდეოს გადაღება. სიმღერის საკუთარი ვერსია 2015 წელს გამოუშვა Electric Six-მა, ალბომზე Mimicry and Memories. 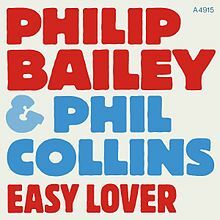 ↑ 1.0 1.1 BPI > Certified Awards > Search results for Phil Collins (page 3). British Phonographic Industry. წაკითხვის თარიღი: 2016-02-16. ↑ Roberts, David (2006). British Hit Singles & Albums, 19th, London: Guinness World Records Limited, გვ. 447. ISBN 1-904994-10-5. ↑ Gold & Platinum Searchable Database - March 29, 2014. RIAA. დაარქივებულია ორიგინალიდან - 2014-05-10. წაკითხვის თარიღი: 2014-03-29. ↑ Rock Music, etc., Terms. spider.georgetowncollege.edu. წაკითხვის თარიღი: 2009-03-23. ↑  Archived January 6, 2012, საიტზე Wayback Machine. ↑ Music Canada : Gold Platinum Database. Musiccanada.com. წაკითხვის თარიღი: 2014-03-29. ↑ MTV Video Music Awards History: Best Overall Performance. Rock On The Net. წაკითხვის თარიღი: 2014-03-29. ↑ Grammy Awards: Best Pop Vocal Performance by a Group or Duo. Rock On The Net. წაკითხვის თარიღი: 2014-03-29. ↑ Final track listing for Mimicry and Memories. წაკითხვის თარიღი: 29 March 2015.
ეს გვერდი ბოლოს დარედაქტირდა: 17:10, 4 ივნისი 2017.